The Rev. 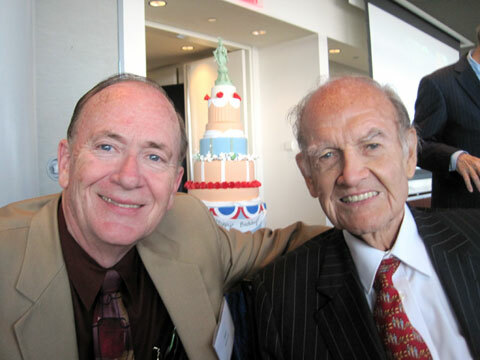 Donald Messer and George McGovern in July at the Newseum in D.C. The Rev. Donald Messer, who’s had had a long and distinguished career in our beloved United Methodist Church, remembers his years of friendship with the late Sen. George McGovern, a Methodist preacher’s son who attended seminary for a year before entry into politics. Nixon and his band of haters were brutal in assassinating the character of McGovern, a World War II hero who inspired millions to join his impassioned and courageous opposition to the Vietnam War. But McGovern was one of the good guys and ended up admired and universally respected for his high-minded morality and principled, if often unpopular convictions. I deeply grieve the passing of a great humanitarian, statesman and long-time personal friend, former United States senator and 1972 Democratic presidential candidate, George S. McGovern. Right up until the final few days before he entered hospice care and died peacefully, McGovern seemed to triumph over aging and to defy death. Most nonagenarians prefer a slower pace, but at age 90, he continued writing books and traveling the country delivering speeches. He penned an op-ed article for the Washington Post in late September and in early October performed a reading of Aaron Copland’s “Lincoln Portrait” at the South Dakota Symphony in Sioux Falls. McGovern’s deepest personal and political passions were to end war and eliminate hunger. He often acknowledged that he did not see much hope in eliminating humanity’s sinful proclivity for using violence but that he did believe that hunger could be ended in his lifetime. He was scandalized that the world had enough food for everyone, but that almost a billion people went to bed hungry every night. At his 90th birthday party in Washington this past July, McGovern was hailed as a hero for his lifetime of pioneering legislation to feed the hungry of the world. Richard Leach, the president of World Food Program USA, proclaimed “no one on the planet” has had a more profound impact on ending hunger. McGovern was saluted by a bipartisan retinue of politicians who credited him with inspiring them to enter politics. As a senator, McGovern wrote legislation to initiate the food stamp program, school lunch program and the supplemental food assistance to women and children (WIC). Later, as a U.N. ambassador, he recruited his former political rival-turned-friend, Sen. Bob Dole (R-Kansas), to sponsor an international school lunch program to feed the hungry children in less economically developed nations. Both men were honored with the prestigious World Food Prize in 2008. In 2005 it was my unique privilege to co-author the book, “Ending Hunger Now: A Challenge to Persons of Faith” with those two men. Though their political philosophies on most international and domestic issues differed drastically, they were united in their Wesleyan heritage that feeding the hungry was at the core of being a Christian. Both were deeply concerned the church was not doing enough to lobby and advocate for the poor and hungry. Born July 19, 1922, to a Methodist preacher’s family in South Dakota, McGovern spent one year as a seminarian at Garrett Theological Seminary before completing his Ph.D. in history from Northwestern University. Deciding his calling was politics, not the ministry, McGovern, however, retained a deep sense of the Social Gospel throughout his political career. To him feeding the hungry was a Gospel imperative as well as integral to a civilized society. I first met McGovern 50 years ago when I was a junior college student in India and he was President John F. Kennedy’s first Food for Peace Director. Living in southern India, I would daily encounter people begging for food and see children starving in the streets. McGovern’s visit to India was welcomed as it signaled food from America would soon be arriving. A decade later, when at the age of 30, I became president of McGovern’s alma mater, Dakota Wesleyan University in Mitchell, S.D., I was immediately engaged in one of the most controversial presidential campaigns in history. McGovern had captured the Democratic nomination with his anti-Vietnam war rhetoric and his grassroots appeal to include everyone in the primary process, not just the political bosses. Though McGovern was a decorated World War II veteran, he was labeled a wild liberal “peacenik.” He was accused of supporting “abortion, acid, and amnesty” for those who had evaded the military draft and fled to Canada. Reporters flocked to the campus seeking to differentiate McGovern’s personal character from his political caricature. Incumbent President Richard Nixon defeated him in a landslide, winning 49 of the 50 states. But a few years later, McGovern was vindicated, when both President Nixon and Vice President Spiro Agnew were forced to resign because of corruption. McGovern was re-elected to the Senate by conservative South Dakota and Republican President Gerald Ford invited him to the White House for consultations, appointing him to serve in the United States delegation at the United Nations. Despite humiliating defeat, and being the target of many a political commentary over the years, McGovern never lost his wry wit, intellectual fervor or moral compassion. Rooted in his Christian faith, he spoke prophetically against war, not only in Vietnam, but also Iraq and Afghanistan. He championed programs for the poor and the marginalized. He forgave his political enemies, even honoring former President and Mrs. Nixon by attending their funerals. He was awarded America’s highest honor, the Medal of Freedom, by President Bill Clinton. At age 90, even as his body became frail, McGovern’s mind was still alert and active. In the past few years, he published several books, most recently, “What It Means to Be a Democrat” (Blue Rider Press, 2011) and a biography called “Abraham Lincoln” (Times Books, 2008). At a signing of the Lincoln book, he was greeted by an overflow audience at the Nixon Presidential Library in Yorba Linda, Calif. He traveled to Kenya and Uganda just two years ago. But, last year, after an exhausting three-city speaking tour of Germany, his doctors urged him to eliminate his international travels. Last December, he was hospitalized after falling near the George and Eleanor McGovern Library at Dakota Wesleyan. He remained hopeful to the end that he would regain strength to renew a vigorous schedule that most 50- year-olds would find too demanding. In a visit just two weeks ago, he expressed to me his appreciation and encouragement for the work we have been doing together on issues of world hunger and global AIDS through the Dakota Wesleyan University McGovern Center. He was thrilled that current students and faculty were carrying on his legacy of feeding the hungry, fighting disease and tackling poverty. His wish of living to 100 and his dream of ending world hunger did not come to fruition. But I’m confident that he faced death without fear. *Messer, a United Methodist pastor and executive director, Center for the Church and Global AIDS, Centennial, Colo., is co-chair of the United Methodist Global AIDS Fund Committee and co-author with George McGovern and Bob Dole of “Ending Hunger Now: A Challenge to Persons of Faith” (Fortress, 2005).